Some Like It Hot - The Funniest Film Ever Made: The Complete Book, Taschen's tribute to Billy Wilder's classic comedy, has been reissued to celebrate the publisher's twenty-fifth anniversary. Some Like It Hot, starring Marilyn Monroe, Tony Curtis, and Jack Lemmon, is arguably the greatest comedy film ever made; its twist ending, with the final line "Nobody's perfect! ", is one of the most famous moments in cinema. The book includes an interview with Wilder, and was originally published shortly before his death. This new edition has a slightly smaller format, and comes with a DVD of the film. The original edition featured a reprint of Marilyn Monroe's annotated script, which is missing from this new edition. It remains a fitting tribute to the film, though, with a complete reprint of the shooting script, publicity materials, media clippings, and a Wilder filmography. Editor Alison Castle has also edited two Kubrick books for Taschen, The Stanley Kubrick Archives and Napoleon, both of which are equally lavish and comprehensive. 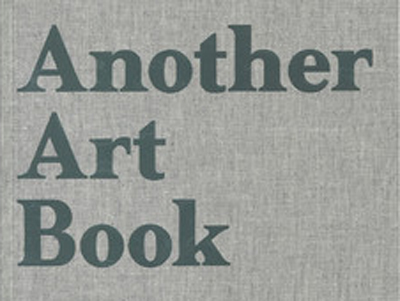 Her collaborator on Some Like It Hot, Dan Auiler, has a less impressive back-catalogue: he did extensive research for his book Hitchcock's Notebooks, but his book on Vertigo included a suspiciously generic foreword by Martin Scorsese, and his advertised books on Taxi Driver and GoodFellas seem not to exist. 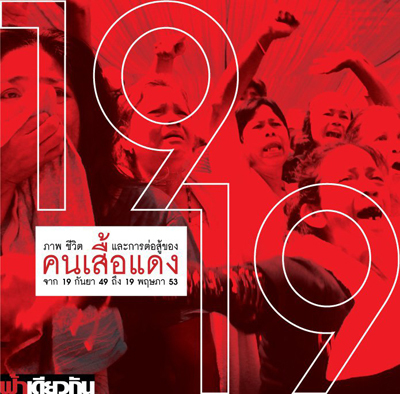 The red-shirt anti-coup movement gained momentum in 2007, with an organised campaign opposing the 2007 constitution. On the other hand, the cause was significantly set back in April 2009, when red-shirt groups started violent demonstrations in Din Daeng. Subsequent red-shirt protests near Democracy Monument in 2010 were peaceful. Much of the book is devoted to the extraordinary events of May 2010, when red-shirt demonstrators were massacred by the army. 19-19 has a bright red cover and endpapers, so it's clear where the publisher's sympathies lie. Previously, Same Sky has distributed a VCD of the Tak Bai incident (volume 2, number 4; 2004), published the evidence from Da Torpedo's lèse-majesté conviction in Thai (volume 7, number 3; 2009) and English (volume 7, number 4; 2009), and was censored in 2005 after it published an interview with controversial writer Sulak Sivaraksa. Chulalongkorn University's International Film Festival 2011 opened today. This year's highlight is the controversial Greek family drama Dogtooth (previously screened at the 2009 Bangkok International Film Festival), which is scheduled for 5th September. The Festival runs until 9th September. 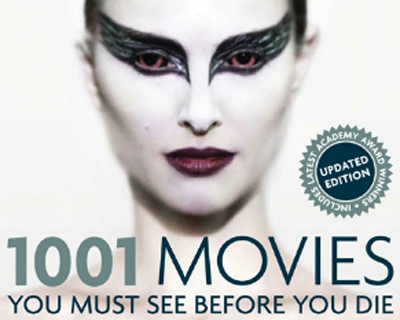 As in previous years (2008, 2008-2009, 2010), all screenings are free. Journey Of The Buddha, the inaugural exhibition of Bangkok's VR Museum, is a collection of Buddha statuettes (collected by Vichai Raksriaksorn) dating from the 9th century onwards. The icons originate from throughout South-East Asia, though primarily from Thailand's Sukhothai and Ayutthaya periods. The majority of the collection is displayed in darkened corridors with atmospheric red uplighting and ambient music. In contrast, an impressive panorama of more recent Buddha images is positioned around one side of the VR's modernist glass dome. 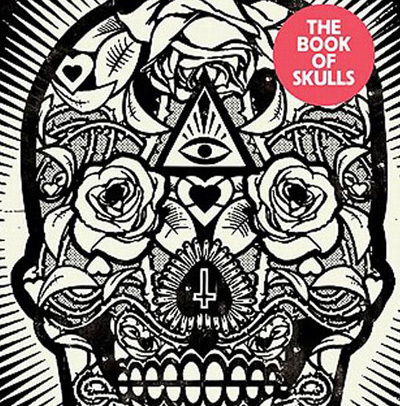 The Book Of Skulls, by Faye Dowling, is a visual survey of the human skull as a design icon, with examples of skull imagery from art, fashion, and graphic design. 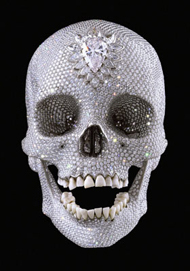 Damien Hirst's For The Love Of God, a platinum skull decorated with 8,000 diamonds, is the ultimate symbol of artistic commodification and fetishisation, and one of the most expensive works by a living artist, though the terms of its sale remain mysterious. 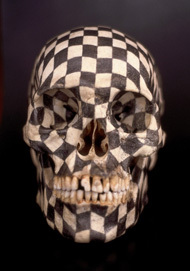 Gabriel Orozco's Black Kites, a chessboard pattern drawn onto a skull, is not included in Dowling's book, though it's an even more direct example of vanitas or memento mori iconography. It also evokes the Dia de los Muertos and Santa Muerte traditions of Orozco's native Mexico. Kulo, a controversial exhibition accused of blasphemy and subjected to vandalism, has been closed prematurely. The exhibition opened on 17th July at the Cultural Centre of the Philippines in Manila, and was originally scheduled to run until 21st August. Kulo was a group exhibition featuring works by thirty-two artists, though Poleteismo, an installation by Mideo Cruz, was singled out for criticism. 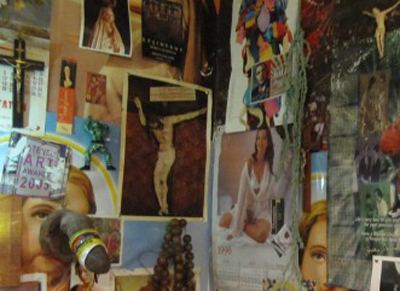 Cruz's installation includes crucifixes and icons of Jesus decorated with wooden dildos and a used condom. President Aquino claimed that Cruz's work is offensive to Christians, which over-rides freedom of expression: "there is no freedom that is absolute". Cruz is now facing blasphemy charges. 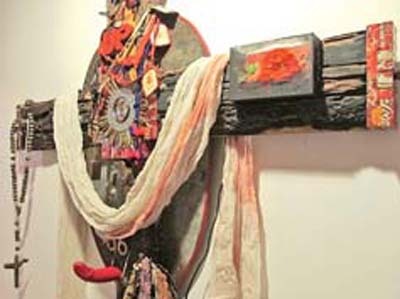 Poleteismo has been shown in Manila several times before: at the Vargas Museum in 2002, at the Kulay-Diwa gallery in 2005, and at Ateneo de Manila University in 2007. It was profiled on the Telecingko television programme in 2005, and featured in a video directed by Sigfried Barros-Sanchez in 2007. Highlights include Ucnt (an irreverent anagram by Jake and Dinos Chapman) and Urine Shroud (a Rorschach blot by Tim Noble and Sue Webster, punning on the Turin Shroud and influenced by Andres Serrano's Piss Christ). The centrepiece, however, is The Stations Of The Cross, David Bailey's glossy photographs of Damien Hirst's passion-of-Christ tableaux, featuring skulls, a cow's head, and lots of blood. The Tree Of Life, directed by Terrence Malick, won the Palme d'Or at Cannes this year. Malick avoids publicity, works intensely, and emerges every few years with another masterpiece (like Stanley Kubrick, though even more so). His first two films, Badlands and Days Of Heaven, are undisputed classics, with gorgeous magic-hour cinematography. The Tree Of Life looks as stunning as his previous works, though its non-linear, almost abstract narrative is surprisingly experimental. The film begins with a mother and father's grief at the death of one of their three sons. How he died is never explained; he would be at the right age to fight in the Vietnam war, though Malick's brother committed suicide and the film may therefore be semi-autobiographical. Later scenes of the sons growing up together in Texas in the 1950s may also be autobiographical, as Malick was also raised in Texas. Like the art film Powers Of Ten by Charles and Ray Eames, The Tree Of Life's perspective is both macroscopic and cosmological. Malick shows us the origins of galaxies, stars, and planets, the development of microbial organisms, the evolution of marine creatures, and the reign of the dinosaurs. These sequences are extraordinary and breath-taking, especially on a large cinema screen. They resemble the interplanetary scenes from Kubrick's 2001: A Space Odyssey, and the analogue visual effects for both films were developed by Douglas Trumbull. The dinosaur sequence (influenced, as are so many other CGI dinosaurs, by Jurassic Park) is arguably a prequel to 2001's 'Dawn of Man' segment; whereas Kubrick used pre-historic apes to illustrate our capacity for violence, Malick's dinosaurs represent nascent compassion, as one dinosaur spares the life of another. The hallucinatory dreamscapes of 2001 - and, less profoundly, Gaspar Noe's Enter The Void and Darren Aronofsky's The Fountain - may be The Tree Of Life's only parallels in commercial cinema; few other films are as ambitious (or audacious). After the dinosaurs are obliterated by a meteorite, paving the way for human evolution, Malick returns to the three sons growing up in Texas. Scenes from their childhoods, remembered by one of the sons as an adult, present an idyllic existence punctuated by occasional moments of unsettling incongruity (a man suffering a seizure; a burning house) and magical-realist fantasy (the mother levitating, and laying in a glass coffin like Sleeping Beauty). These scenes are presented impressionistically, like snapshots from a photograph album, out of sequence and often without dialogue, leaving many events unexplained. There is an unavoidably religious element to the film: it opens with a quotation from the Book of Job, and concludes with a family reunion on a heavenly beach. 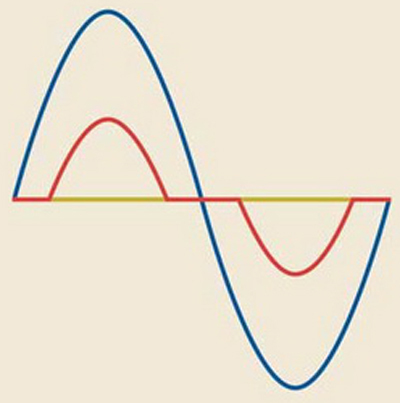 A purely abstract light pattern seen at the start and end of the film may thus represent a divine presence. I was put off by the religiosity, and the pretentious whispered voice-over, though more importantly I was captivated by the scope of the narrative.